This book was brought to my attention by one of my avid grade three readers and his mother. “Ms. L, you HAVE to ready this!” “Ms. L, have you read it yet?” “Ms. L, Can you read it to the class?” If you know anything about an avid reader and a grade three student, you know they are persistent. I took the book home to read and could not put it down. R. J. Palacio creates a deep sense of empathy for young August, a boy who has a severe facial deformity and has been home schooled. August has had over 27 operations in his short life. He decides he want to go to public school and with that he begins a journey into the broader realms of humanity. He is accepted by some and bullied by others. 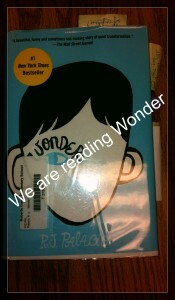 The young reader can identify with Auggie, as he is funny, serious, playful and trying to fit into grade school. I highly recommend this book for children from grade 3 to high school. Quite honestly, I absolutely loved it so I would recommend it as a read-aloud for nighttime reading. The book will open doors for parents or grandparents to many conversations on similarities, differences and common ground.